Greetings from UCAM (Universidad Catolica San Antonio de Murcia) and hope all is well with you. UCAM and one of our partner university in Indonesia – Atma Jaya Catholic University proudly invite you to “Spanish Latin Cultural Day“. 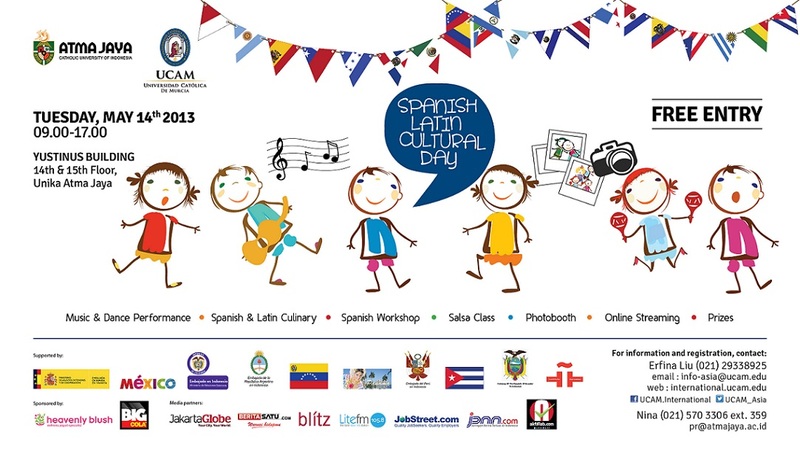 This exciting edutainment event is supported by Embassy of Spain, Embassy of Mexico, Embassy of Columbia, Embassy of Venezuela, Embassy of Argentina, Embassy of Peru, and Embassy of Panama whose each representative will attend to officially open the event.